The Belgian city council of Molenbeek voted to exclude businesses active in the Israeli occupation of Palestine in its bid for surveillance cameras, reports the Workers' Party of Belgium (PTB). On November 26 the city council, located in the Brusself capital region of Belgium, conducted a meeting to decide upon terms of the € 1.8 million bid for new security cameras. During the meeting council member Dirk De Block (PTB) introduced an amendment to the bid: no business active in the Israeli occupation of the Palestinian territory or in unethical conduct would be allowed to compete. 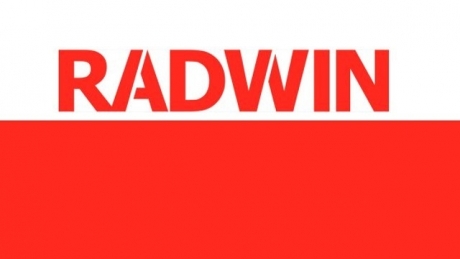 When tabling the amendment, De Block noted that the Israeli security company Radwin, together with its Belgian counterpart Blue Vision, had a large share of municipal and cities markets for the installation of sophisticated surveillance camera networks. The mayor argued against this amendment, and it was anticipated that the councilors would follow her instructions and vote against her. To her surprise, however, a majority voted in favour of the amendment. City council Chairman Michel Eylenbosch then argued that the councilors “misunderstood”, and called for another vote, a call that was roundly rejected as an attempt to vote until the mayor's desired outcome was reached. Historic: UAW 2865, UC student-worker union, becomes first major American labour union to support divestment from Israel by membership vote. In solidarity with Palestinian workers and students, voting members approve call for divestment by 65 percent; 52 percent pledged to support academic boycott. UAW 2865, a labor union representing over 13,000 teaching assistants, tutors, and other student-workers at the University of California, has become the first major U.S. labor union to hold a membership vote responding to the Palestinian civil society call for boycott, divestment and sanctions against Israeli occupation and in solidarity with Palestinian self-determination. The vote passed, with 65% (almost 2/3) of voting members in support. Over 2100 members voted, a testament to union democracy. 3) the US government to end military aid to Israel. 4) 52 % of voting members also pledged not to “take part in any research, conferences, events, exchange programs, or other activities that are sponsored by Israeli universities complicit in the occupation of Palestine and the settler-colonial policies of the state of Israel” until such time as these universities take steps to end complicity with dispossession, occupation, and apartheid. 1136 members pledged to observe the academic boycott, a reflection of the ways student laborers are taking concrete actions to practice solidarity. In July, the union’s Joint Council, comprised of 83 elected officers across nine UC campuses, published an open letter outlining support for the Palestinian civil society call for Boycott, Divestment, and Sanctions (BDS) “against public institutions and corporations that profit from Israeli apartheid and occupation of Palestinians.” This open letter announced it would seek a membership vote on the matter in the coming academic year. The UAW 2865 Joint Council took these steps in response to a call for solidarity from all major Palestinian trade unions, including the Palestinian University Teachers’ Association, The Joint Council’s open letter was followed by four months of internal debate prior to the election and deep engagement by members statewide. 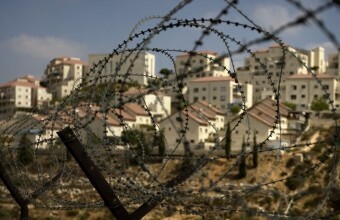 The goal of the non-violent global BDS strategy is that Israel will end land confiscation and human rights violations against Palestinians in the West Bank and Gaza, recognize rights of Palestinian citizens of Israel as over 50 Israeli laws currently discriminate against them, and respect the right under international law of Palestinian refugees to return to their homes. UAW 2865 joins several labor unions in the United Kingdom and Ireland, UNITE New Zealand, CUPE in Canada, COSATU in South Africa and many dockworker unions around the world. It also joins growing grassroots voices in the U.S. labor movement including rank and file members of the International Longshore Workers’ Union Local 10 that supported community pickets and successfully blocked Israeli ships from unloading goods similar to their historic involvement in the anti-South African apartheid movement, and hundreds of labor organizers who signed onto the Labor for Palestine statement. Within the UAW itself, Local 2865 follows the precedent of Arab-American auto workers in Detroit in 1973 who protested the union’s purchase of Israeli bonds financing the seizure of Palestinian lands. Just as black workers at Polaroid in the U.S. launched a boycott of their company for helping make apartheid passbooks for South Africans, we support workers in other UAW-unionized industries in pressuring their employers to commit to socially responsible business practices so that the illegal occupation of Palestinians comes to an end. The mostly graduate student worker union joins the undergraduate student governments of UC Berkeley, UC San Diego, UC Riverside, UC Irvine, and UCLA which have passed resolutions in support of divestment. The Brazilian state of Rio Grande do Sul has cancelled a major collaboration deal with Israeli military company Elbit Systems in the wake of protests over the firm’s role in oppression of Palestinians. 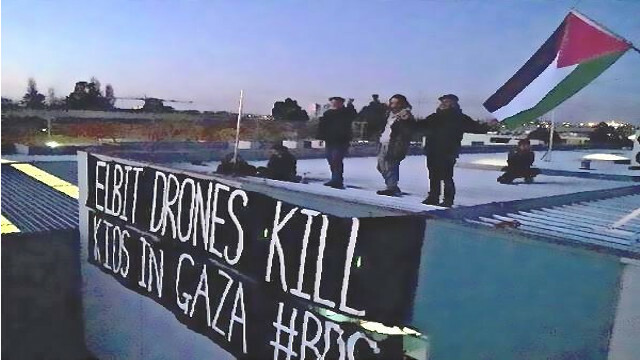 Drones supplied by Elbit Systems were tested during Israel’s recent attack on Gaza that killed more than 2,100 Palestinians, and Elbit’s share price has risen since the massacre as investors anticipated a rise in orders of technology that was used for the first time during the attacks. Rio Grande do Sul governor Tarso Genro had signed a research cooperation deal making Elbit the first Israeli military companyto lead Brazilian military projects in April 2013. Elbit was to be provided access to public funding and technologies produced by four local universities. Ongoing protests and lack of federal support had weakened the project. In his open letter, Genro declared the memorandum of understanding to be “void of meaning”. A $17m plan to build a military satellite is among the projects cancelled by Tuesday’s announcement. The Brazilian state of Rio Grande do Sul has revoked a major collaboration deal with the Israeli military company Elbit Systems in the wake of protests over the firm’s role in serious violations in the occupied Palestinian territories. Brazilian social movements and trade unions as well as Palestinian groups in the country had called on the Brazilian authorities to cancel the deal over Elbit’s role in the construction of Israel’s illegal apartheid wall in the occupied West Bank and Jerusalem and its cooperation with the Israeli army, especially during the last war on the Gaza Strip. "Our government has always given centrality to the promotion of peace and human rights and considers the demands of the social movements an important voice that needs to be heard. Today’s announcement is a logical consequence of this," Tarson Nunez, coordinator of the international relations department of the Rio Grande do Sul government, stated. Rio Grande do Sul governor Tarso Genro had signed in April 2013 a research cooperation deal making Elbit the first Israeli military company to lead Brazilian military projects. According to this deal, Elbit was also to be provided access to public funding and technologies produced by four Brazilian universities. In a press release, Genro declared the memorandum of understanding with the Israeli company to be void. Divestment organizers at UCLA, representing a wide coalition of students from all backgrounds and sectors of campus, celebrated a milestone victory for social justice with the passage of "A Resolution to Divest from Companies Engaged in Violence against Palestinians." The resolution, sponsored by Negeen Sadeghi-Movahed, Conrad Contreras, and Manjot Singh, passed by an 8-2-2 margin. It was sponsored by 15 student organizations and endorsed by an additional 17, making for 32 total student groups in support of divestment. UCLA's vote marks the 6th of 9 undergraduate University of California campuses to have taken a majority vote in support of divestment from corporations that violate Palestinian human rights. Council members from a variety of political affiliations voted in favor of the resolution, including independents, progressives, and a member of the campus' moderate party. Before the vote, council members expressed their admiration and respect for the coalition building, education, and outreach by SJP-UCLA during our campaign. Also notable was the positive tone of the hearing and discussion, wherein most council members affirmed their support for one another regardless of their votes. The resolution could not have been successful without the support of the students from many communities who came out to speak in its favor and who stayed at the hearing until it passed. 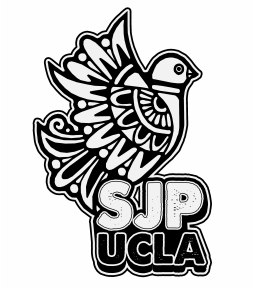 Alaa Abuadas, the programming director for SJP-UCLA said, "as a Palestinian, I want to thank every single person who helped us pass this bill, for getting us one step closer to a free Palestine." This resolution's victory does not mark the end of SJP's efforts. SJP sees the passage of divestment as a chance to help other communities use this tool as an avenue to attain more political agency. On that note, the organization sees this vote as laying a principled foundation from which students from myriad backgrounds can continue to educate and organize in support of not just Palestinian rights but all causes of social justice. The European Union (EU) is mulling over imposing penalties on European companies operating in Israeli settlements or involved in settlement-related activities in the occupied Palestinian territories of the West Bank and Jerusalem, according to Haaretz newspaper. This came in an internal EU document on proposed sanctions against Israel, published by Haaretz on Monday. The document, which was released following a recent meeting of EU foreign ministers in Brussels, also proposes actions against settlers themselves, including a "no contact" policy toward settler organizations or any Israeli figure who opposes the establishment of a Palestinian state. Among the punitive moves under consideration are to clearly label products from Israeli settlements and to summon European ambassadors from Tel Aviv. The document reflects the EU's impatience with Israel's settlement expansion that threatens the possibility of establishing a Palestinian state. In another context, the EU foreign ministers, following their meeting in Brussels, called on Israel to respect the Islamic holy sites in occupied Jerusalem and expressed concern over the recent violent events in the occupied territories. They also called in a statement on Israel not to quell Palestinian protestors, warning that the use of violence against the Palestinians leads to more instability in the occupied lands. Their statement urged Jordan to assume its administrative responsibilities towards the Aqsa Mosque in Jerusalem and take concrete steps in accordance with its peace treaty with Israel to reduce the current tension between the Palestinians and Israelis. 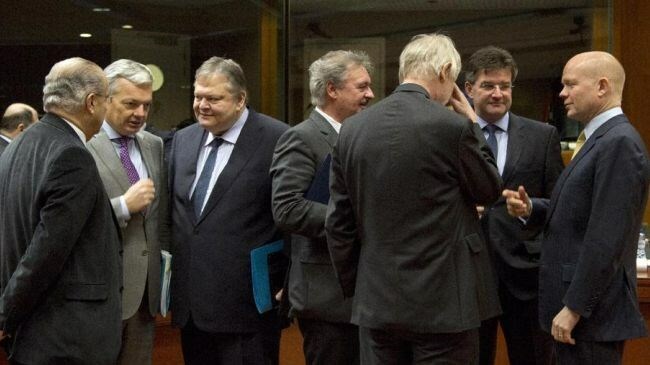 The EU also demanded Israel to end its blockade on the impoverished Gaza Strip. 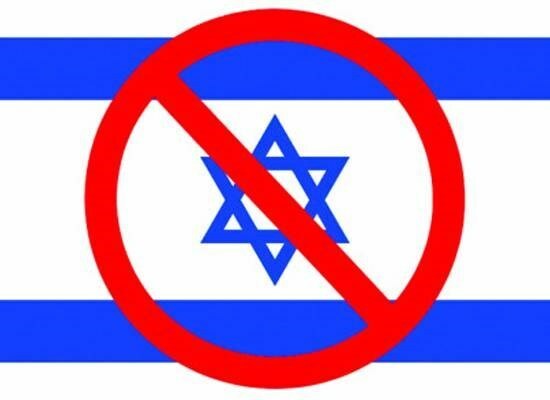 Heads of Israeli universities expressed concern over a proposal to boycott Israel academically the Arizona-based Middle East Studies Association (MESA) of North America intends to discuss next week. Yedioth Ahronoth website quoted Dean of the heads of Israeli universities Menachem Ben-Sasson as saying that if such boycott decision was taken, there would be serious impacts on Israeli universities and studies institutions, hoping that few members vote in favor of the proposal. It added that the representatives of Israeli universities and the ministry of foreign affairs started to conduct calls to thwart the approval of the proposal. MESA is a non-political association that fosters Middle East-related studies with more than 2,700 senior founding members and now serves as an umbrella organization for more than sixty institutional members and thirty-nine affiliated organizations, according to the American association's website. Such a decision came after over 100 noted Middle East studies scholars called in a recent letter for boycotting Israel academically for committing grave violations against Palestinian universities, including its bombing of universities during the last war on Gaza and its raids on West Bank universities. "More generally, the Israeli state discriminates against Palestinian students in Israeli universities and it isolates Palestinian academia by, among other tactics, preventing foreign academics from visiting Palestinian institutions in Gaza and the West Bank. We are also alarmed by the long history of confiscations of Palestinian archives and the destruction of libraries and research centers," their letter stated. Garment factories in illegal Israeli settlements have been re-labeling their products with international brand names for marketing them in Palestinian stores, said the Ministry of National Economy. According to WAFA Palestinian News & Info Agency, Israeli garment businesses operating in illegal West Bank settlements are palming off their products in the attempt to circumvent the boycott campaign and construct inroads into the Palestinian market. The Consumer Protection Directorate crews are said to have closely monitored a vehicle loaded with Israeli garments while exiting the illegal settlement of Burkan, and heading to Salfit market. After the driver was caught red-handed, her was brought before a competent court. 1) raw or processed fabrics to be supplied by Burkan garment factories to the tailoring workshops in order to weave clothes. 2) this clothing to be moved back to the factories, where international clothing brand labels are attached to them, in an attempt to promote them as non-settlement products in Palestinian markets. WAFA reports that, in April of 2010, President Mahmoud Abbas signed a law banning trade and promotion of settlement products in Palestinian markets.